A light and refreshing Mediterranean-style meal made with egg whites and cucumber-yogurt sauce. In a medium skillet, sauté asparagus until tender, about 7 minutes. Set aside. In a small bowl, combine egg whites and tzatziki; stir to combine. Spray nonstick skillet with cooking spray and bring to medium heat. Pour in egg white and allow it to spread over the skillet surface. Cook until egg turns white; about 2 minutes. 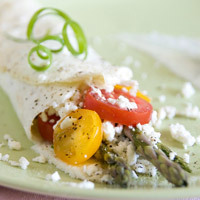 Slide omelette onto a plate and place asparagus, tomatoes, green onions, and feta in the middle third of the omelette. Fold the sides of the omelette over the middle to cover the fillings. Serve hot with additional tzatziki. Salt and pepper to taste.